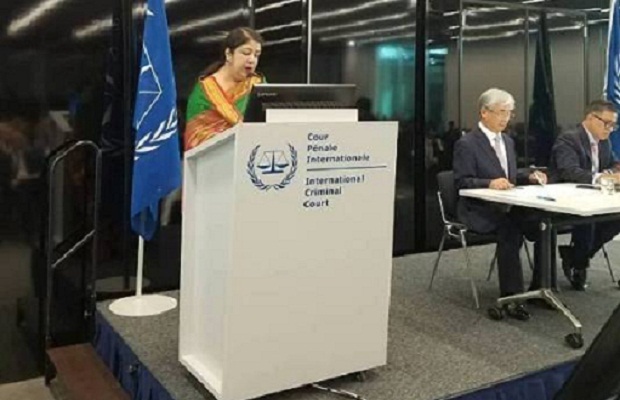 Bangladesh has reiterated its support to the Rome Statute and the International Criminal Court (ICC) to put an end to the impunity, bring the perpetrators of the world’s most heinous crimes to justice and uphold the rule of law. Speaker Dr Shirin Sharmin Chaudhury conveyed Bangladesh's position during the celebrations of the 20th anniversary of the adoption of the Rome Statute in The Hague on Tuesday. Referring to the trial of those who committed war crimes, genocide and crimes against humanity during Bangladesh’s War of Independence in 1971, following the ‘complementarity’ principle enshrined in the Rome Statute, the Speaker said Bangladesh has demonstrated its firm commitment to the Rome Statute by undertaking this challenging task. Drawing the States Parties’ attention to the devastating consequences of the recent influx of forcibly displaced Rohingyas to Bangladesh, she highlighted Bangladesh’s genuine efforts to facilitate voluntary return to their homes in safety, security and dignity. Shirin Sharmin also mentioned that an innovative aspect of the Rome Statute is the creation of Trust Fund for Victims facilitating reparative justice, according to a message received from The Hague. She extended Bangladesh’s support to the Trust Fund as it will help soothe the victims. The Speaker drew the attention about the technological progress that is superseding the national borders and stressed on the importance of ICC’s flexibility and openness to new ideas and voices to remain relevant to the coming decades and to put an end to impunity, uphold the rule of law and ensure access to justice for all peoples. She also stressed on the importance of recognising the principle of universality and supporting the realisation of the same. High-level representatives from the States Parties to the Rome Statute, including the President of Nigeria; Ministers and Parliament Speakers from a good number of States Parties, attended the celebrations of the 20th anniversary of the adoption of the Rome Statute in The Hague.